stores messages while you are offline. Rizon offers this service for FREE, but the bouncer can only be connected to Rizon, not other networks. Use the bouncer at least once every 2 weeks. Do not advertise channels, flood or spam. Do not use /amsg or /ame (messages all channels). Follow network rules (/motd in your IRC client to view them). One BNC account per person. Your BNC will be removed if a rule is broken. You must have a registered nick for at least 7 days. Connect to the network using a secure connection. Wait for the BNC to be manually approved. Once approved, you will receive a memo from MemoServ. You cannot switch between EU and US after your initial choice, and neither the ident or realname can be changed after your request has been approved. Note to users connecting from Iran: Please request the EU instance, as you cannot connect to the US instance. -MemoServ- It is with great pleasure that we inform you that your BNC application has been APPROVED. To log on to your BNC, connect to RizonBNC.us.rizon.net on port 1234 for non-SSL and port 12345 for SSL with the server password 'yournick:25p0ok1'. Thank you for flying Rizon! You can then use your server/login credentials as shown below. To replace auto-generated password with the one you desire, see Getting a new password. Instead of connecting to Rizon, you connect to the bouncer. Replace BNCPASSWORD with your BNC password. See /msg *status HELP to view your available options. Auto away: The BNC will set your away status automatically. Read /msg *simple_away HELP to read about auto-away and its settings. Private messages: Private messages you received while not connected to the BNC will automatically be sent to you when you connect to the BNC. Channel messages: For each channel you want messages from, /msg *status SETBUFFER #channel 100 will send you the last 100 messages on the channel when you connect to the BNC. The maximum amount of lines you can set for a channel buffer is 1000. /msg *nickserv SET password Yes, use the *. If you want to leave for >2 weeks, reapprove an inactive BNC, or anything else: /join #RizonBNC, ask, and wait until someone responds. You can get several error messages after you tried to request a BNC. You can follow following intructions if you get those errors. Enter your nick and select either "RizonBNC US" or "RizonBNC EU" from list. Note: The password will be starred out on your computer, it is only shown here for demonstration purposes. Click on 'Server' and 'Auth'. Enter rizonbnc.us.rizon.net:+12345 into the 'Server address' field. Change the dropdown from 'NickServ' to 'Pass'. 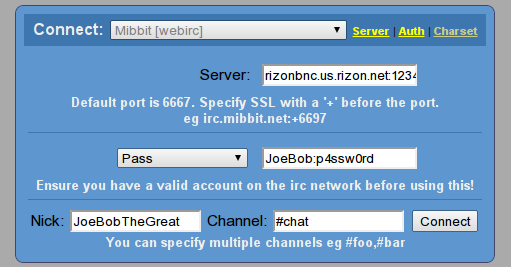 Enter your RizonBNC password in the format user:pass. You won't need to change the nick, and you can leave the channel parameter out. Hit Enter. 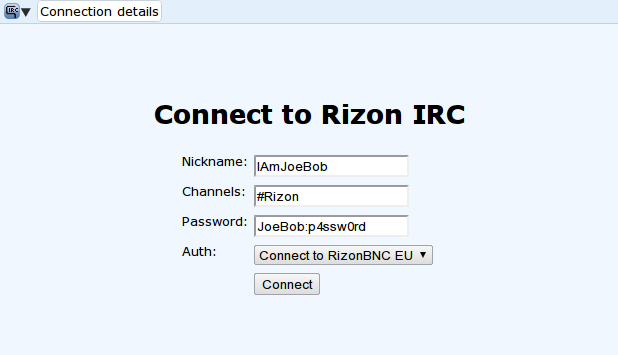 For EU BNC: Change step 3 to rizonbnc.eu.rizon.net:+12345 as the address. Note: Password would normally be starred out, it is only shown for demonstration purposes. Go to ChatZilla > Preferences. Change the 'Nickname' field to your desired BNC nick. If you do not modify this setting it will change to that nickname as soon as you connect to your BNC. In the text bar below, type /sslserver rizonbnc.us.rizon.net:12345 user:pass, and hit Enter. You should be in, if you're not then you typed your user and password incorrectly, or you went to the incorrect server.